Product categories of Dry Type Transformer, we are specialized manufacturers from China, Dry Type Transformer , Resin Dry Type Transformer suppliers/factory, wholesale high-quality products of Dry Type High Voltage Transformer R & D and manufacturing, we have the perfect after-sales service and technical support. Look forward to your cooperation! Dry type distribution Transformer(Dry-type Transformer) receives power from 6kV switchgear of the power supply system of nuclear power station and supplies power for 380V switchboard. 1E-level is defined as the safety level of the electrical equipment. It has the following functions including emergency shut-down of the reactor, isolation of containment vessel, emergency cooling of reactor core, after-heat removal of reactor, heat conduction of the reactor building, and prevention of emission of radioactive substance. The high-voltage winding of 1E-level SG(H)B10 dry type distribution transformer developed by Baoding Tianwei Shunda Transformer Co., Ltd. adopts high-quality copper conductor and continuous winding and the low-voltage winding adopts copper foil and foil type structure. The insulation system of dry type distribution transformer mainly consists of Nomex insulation paper. 1E-level SG(H)B10-1000/6.3 dry type distribution transformer passes insulation and thermal ageing tests, shock test, short-circuit test, climate (C2) test, environment (E2) test and fireproofing (F1) test. The transformer has metal protection shell and reaches protection grade of IP30. The shell has one front door and one back door, and provides easy access to the transformer in two directions. Shell Dimensions: Length 2000mm, Width 1300mm, Height 2200mm. The shell is fastened to the body of the transformer which is easily installed. The transformer has no fan and adopts natural cooling. It is equipped with a temperature controller with strong ability of anti-electromagnetic interference. 1E-level dry type distribution transformer is epoxy resin encapsulated dry type distribution transformer. Through the appraisal of the relevant provincial experts, 1E-level SG(H)B10 dry type distribution transformer developed by our company is unencapsulated H-level dry type distribution transformer, and has safe structure and simple and reliable process. 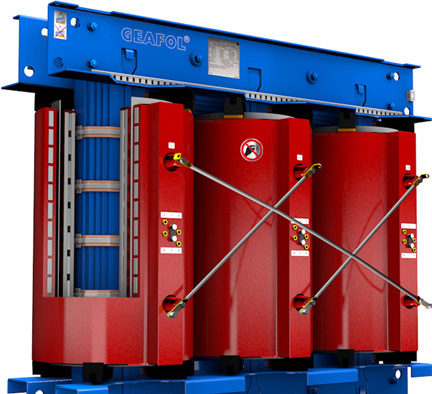 Nomex unencapsulated Dry Type Transformer is used as 1E-level equipment by the nuclear power station for the first time. The technical performance reaches the advanced level of international like products and fills in the domestic blank.